Huddersfield Town beat Sheffield Wednesday on penalties to reach the Championship play-off final. 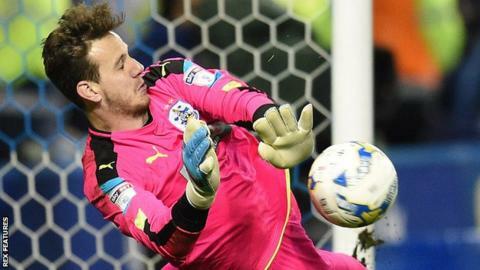 Terriers keeper Danny Ward saved from Sam Hutchinson and Fernando Forestieri in the shootout to give Town a 4-3 win. Steven Fletcher put the Owls ahead when he headed home Barry Bannan's cross but the visitors levelled when Collin Quaner's cross was turned in by Nahki Wells via a deflection from Tom Lees. Town will now face Reading at Wembley for a place in the Premier League. It had always looked possible that the tie would go the distance after Sunday's opening leg between the two sides had ended scoreless, with the Owls failing to manage a single shot on target. Despite losing Ross Wallace to injury early on, the hosts made a bright start to the second leg and sub Adam Reach forced a sharp save from Terriers keeper Danny Ward at his near post. However, Town had the best chance in the first half but Izzy Brown's shot hit the outside of the post after Wells had found the Chelsea loanee with a low cross. Wednesday opened the scoring when Bannan, who was given a far more free role compared to the first game, sent a perfectly-measured cross to the back post where Fletcher rose above Christopher Schindler to head in. After initially being rocked, Town responded well and got a deserved equaliser when Collin Quaner got on the end of a neat ball from Brown and squared a low ball across the face of goal, which Lees inadvertently diverted in to level the tie with 15 minutes to go. Both teams had chances to win it in extra time but Wales international Ward saved well from Jordan Rhodes and Wells fired into the side netting after a mishit-shot broke to him. Town eventually prevailed when Liverpool loanee Ward dived to his right to keep Forestieri's effort out and set up an appearance against the Royals at Wembley on Monday, 29 May. Huddersfield Town finished last season with a 5-1 home defeat by Brentford to finish 19th in the second tier. Boss Wagner, who had joined in November 2015, subsequently carried out a major overhaul of the squad in the summer to bring in players who could execute the pressing game he wanted the side to play. Loanees Aaron Mooy, Ward and Brown, along with Germany-born imports Chris Lowe, Michael Hefele and Elias Kachunga, have all been integral to the Terriers' success. Wagner, who joked prior to the game that "everyone knows Germans are able to win penalties", has maintained all campaign that his team were underdogs for promotion - but they are now just 90 minutes from reaching the Premier League for the first time in their history. He said after the game: "Everyone knows most pundits said we would be in relegation trouble or we'd get relegated and now we're one step away from the Premier League. We are the small dog, the terrier, but we have belief. "Now we are in the final the fairytale goes on and we want to write the last chapter at Wembley." This was the second successive season that Sheffield Wednesday had reached the Championship play-offs under Portuguese head coach Carlos Carvalhal, following defeat by Hull City in last season's final. Despite leading Wednesday to a fourth-place finish this campaign, questions have been raised about his position amid speculation linking former Newcastle and Crystal Palace boss Alan Pardew with the club. Carvalhal said that now was "not the time" to discuss his future after what he called a "heartbreaking" defeat. When he took over in 2015, Thai owner Dejphon Chansiri said he wanted promotion back to the Premier League within two years and he may now look to make a change in the summer. Match ends, Sheffield Wednesday 1(3), Huddersfield Town 1(4). Penalty Shootout ends, Sheffield Wednesday 1(3), Huddersfield Town 1(4). Penalty saved! Fernando Forestieri (Sheffield Wednesday) fails to capitalise on this great opportunity, right footed shot saved in the centre of the goal. Penalty saved! Jack Payne (Huddersfield Town) fails to capitalise on this great opportunity, left footed shot saved in the bottom right corner. Goal! Sheffield Wednesday 1(3), Huddersfield Town 1(4). Jack Hunt (Sheffield Wednesday) converts the penalty with a right footed shot to the bottom right corner. Goal! Sheffield Wednesday 1(2), Huddersfield Town 1(4). Aaron Mooy (Huddersfield Town) converts the penalty with a right footed shot to the top left corner. Goal! Sheffield Wednesday 1(2), Huddersfield Town 1(3). Kieran Lee (Sheffield Wednesday) converts the penalty with a right footed shot to the bottom left corner. Goal! Sheffield Wednesday 1(1), Huddersfield Town 1(3). Nahki Wells (Huddersfield Town) converts the penalty with a right footed shot to the bottom left corner. Goal! Sheffield Wednesday 1(1), Huddersfield Town 1(2). Barry Bannan (Sheffield Wednesday) converts the penalty with a left footed shot to the bottom right corner. Goal! Sheffield Wednesday 1, Huddersfield Town 1(2). Michael Hefele (Huddersfield Town) converts the penalty with a right footed shot to the bottom right corner. Penalty saved! Sam Hutchinson (Sheffield Wednesday) fails to capitalise on this great opportunity, right footed shot saved in the bottom right corner. Goal! Sheffield Wednesday 1, Huddersfield Town 1(1). Chris Löwe (Huddersfield Town) converts the penalty with a left footed shot to the bottom right corner. Penalty Shootout begins Sheffield Wednesday 1, Huddersfield Town 1. Second Half Extra Time ends, Sheffield Wednesday 1, Huddersfield Town 1. Jack Payne (Huddersfield Town) wins a free kick in the attacking half. Attempt missed. Jordan Rhodes (Sheffield Wednesday) header from the centre of the box misses to the right. Assisted by Barry Bannan with a cross following a set piece situation. Attempt missed. Jordan Rhodes (Sheffield Wednesday) header from the centre of the box is close, but misses to the right. Assisted by Sam Hutchinson with a cross. Corner, Huddersfield Town. Conceded by Barry Bannan. Attempt blocked. Tommy Smith (Huddersfield Town) right footed shot from outside the box is blocked. Assisted by Jonathan Hogg. Attempt missed. Collin Quaner (Huddersfield Town) right footed shot from the right side of the box misses to the left. Assisted by Tareiq Holmes-Dennis with a cross. Attempt missed. Nahki Wells (Huddersfield Town) left footed shot from the centre of the box is close, but misses to the right following a corner. Attempt blocked. Tareiq Holmes-Dennis (Huddersfield Town) left footed shot from outside the box is blocked. Substitution, Sheffield Wednesday. Atdhe Nuhiu replaces Daniel Pudil. Second Half Extra Time begins Sheffield Wednesday 1, Huddersfield Town 1. First Half Extra Time ends, Sheffield Wednesday 1, Huddersfield Town 1. Substitution, Huddersfield Town. Tareiq Holmes-Dennis replaces Rajiv van La Parra. Attempt saved. Jordan Rhodes (Sheffield Wednesday) right footed shot from the centre of the box is saved in the centre of the goal. Assisted by Kieran Lee. Corner, Sheffield Wednesday. Conceded by Christopher Schindler.